Wherever we can, ReAgent aims to support educational centres in the name of science, to ensure the youths of today continue to enjoy the subject and grow up to be the next generation of great scientists. 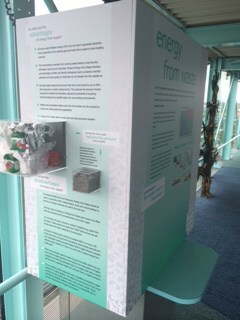 We are a member of MOSI and a supporter of Chemistry with Cabbage. We were recently approached by the Catalyst Science Discovery Centre in Widnes who asked us to supply them with some chemicals for their chemistry demonstrations that help to educate primary school children in Science. We were happy to supply the chemicals free-of-charge, and in return we were invited to have a look around the Catalyst Science Discovery Centre and sit in on one of their fascinating chemistry demonstrations, filled with colourful and explosive experiments. During our tour around the centre, we learnt a lot about its origins and how it continues to thrive. We found that they get support from a number of other organisations that all understand the importance of working towards the education of young people and helping to ensure the centre has up-to-date technology and resources. The Catalyst Science Discovery Centre was built around 26 years ago and interestingly, the land was previously used as Gossage’s Soap Factory. You can take a trip back in time and watch a black and white video of workers leaving the soap factory in Widnes. As the Marketing Officer at Catalyst, Meryl, showed us around the abundance of different and exciting rooms, our inner children surfaced and we discovered things about the science world that amazed us. The first room we entered was a hands-on area where children have the chance to explore the science of everyday life in a fun and interactive way. 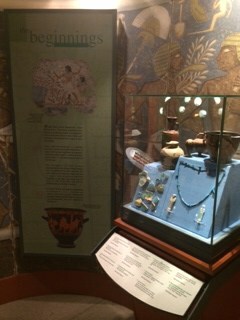 This room was buzzing with children on a school visit that enjoyed sampling the activities available. There was a glass lift that ascended us up to the rooftop Observatory Gallery where you can see all the way out to the Welsh hills. The gallery holds an exhibit linked to preserving the environment, as well as educational geography workshops to inform children about sustainable environmental matters such as recycling. We were told that Brownie and Scout sleepovers are even hosted in the gallery, where children can have dinner and watch a film in the evening, and then have breakfast and get involved in some scientific workshops the next morning. 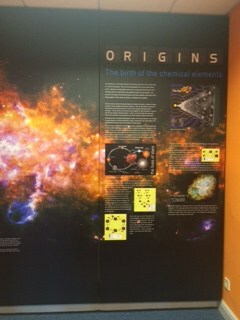 The ORIGINS project was a competition funded by the Royal Society of Chemistry, which Catalyst won a prize of £10,000 for. Meryl was one of the designers of the poster and some of the prize fund is going towards even more workshops for the children. We finished off the tour by joining a local school in the viewing of a chemistry show, and were just as fascinated and surprised by the experiments as the children! 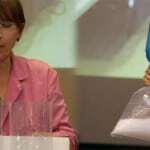 The show used many of the chemicals supplied by ReAgent to show stunning reactions and uses in chemistry. The host of the show had bags of energy and knew just how to get the children excited about the experiments, whilst educating and encouraging them so they volunteered to answer almost every question. 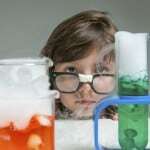 He demonstrated elements of chemistry by making it relatable to children; through the use of balloons, teddy bears and at one point pretending he was going to blow up a teacher. (The children were very enthusiastic about this one). 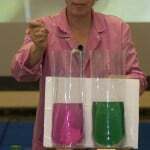 During the show, the host demonstrated the viscosity of liquids by having the kids “race” each other by pouring liquids, to show that liquids have varying levels of thickness and this causes them to flow at different rates. 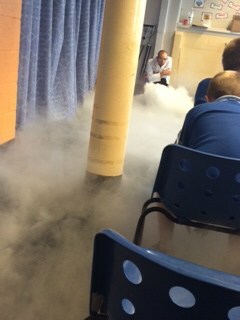 The children were greatly fascinated by a dry ice demonstration. 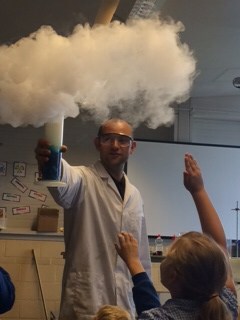 During this, the host added food colouring and washing-up liquid to a mixture in a beaker, so that it overflowed with bubbles and a visible gas. He then handed out “clouds” to the outstretched hands of the children who all wanted to hold the mixture themselves. To round off the show, the host soaked a banana in liquid nitrogen to show how it could then be used to hammer a nail into wood. He repeated this experiment with fresh flowers and was able to smash them into pieces on the floor as they’d become so brittle. This reminded me of artwork by Jon Shireman who used this technique to smash flowers into jagged pieces.